Central, Jewish area & Luxury apartment, very Central Location, 4 min walking to- Ghetto Sqaure, 7 min to Old Synagogue ie Jews Quater and also littel further 7 mins down is the Old Town. 50 meters from Schindlers Factory. Its a Band New apartment :-) located very Central but extremely peaceful apartment overlooking Gardens. Its in one of the most Up-Market Residences Complex in Krakow. We are offering at Very SPECIAL PRICE OR DISCOUNTED PRICE just to get started and get feedbacks. Please look at the photos and email us ... and you will realise its very special price. 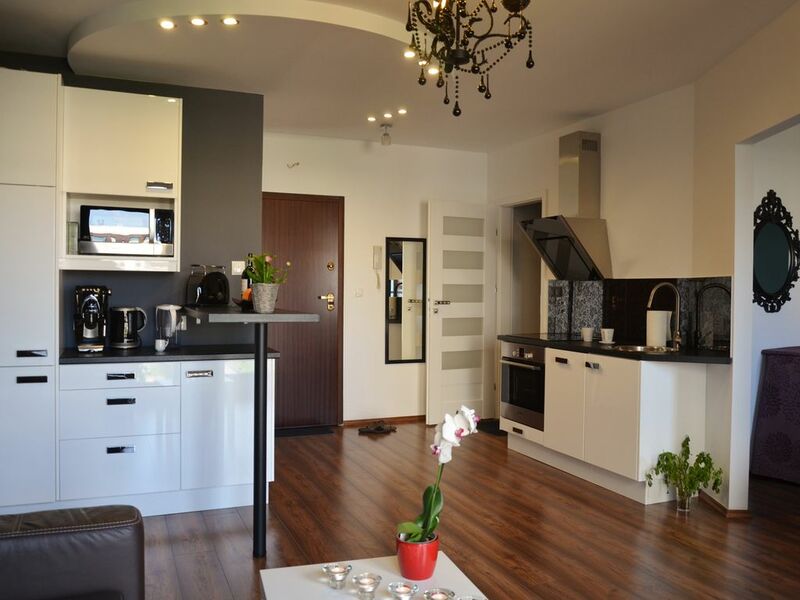 1 Bed room & 1 Living room appartment in Krakow one most upmaket appartment complex with grocery shop down stairs, Cafe and also less than 5 mins walk to the tram stop. Taxi to Old Town is 14zl ie $5 or 4 Euro. Taxi to Kaszimisz Jewish District is 11zl ie $4 or 3 Euro. Very modern appartment with , 1 Bed Room and 1 Living Room, 1 Bathroom, Toilet and open Kitchen. Want to cook nice breakfast or lunch , you have everything here. Make your mornings special with nice Coffee from our Machine and feel free to use juicers , mixer, toaster you prefer. Get the benefit of a Top Class Hotel and at the same time... a real home away from home. Just downstairs , there is a Spa Centre- there is Modern Gym, Swiming pool, Sauna- Dry & Wet, and also massage & beauty . Also very close and 5 mins walking is Hotel Qubus , a 4 Star Hotel. Very close by is ATM, few restaurants. We are Specialist Travel Organisers here in Krakow, other European Cities and also Asia. My husband and I visited Krakow for the first time. We had used HomeAway before so searched for accommodation on this site. We were not disappointed. The apartment is fairly new, spotlessly clean and well equipped. We went in December and the apartment was lovely and warm. We ate out most of the time but had hot drinks and cereals etc in the morning so cannot really comment if there would be enough pots and pans for cooking, but there certainly is lots of equipment: oven, microwave, toaster, coffee machine, big fridge and dishwasher. I used the hairdryer provided which was powerful and adequate for my medium length hair. We walked most places, it is about half hour walk to the Main Market Square, you go over the bridge and more or less one straight road. There are buses, trams and taxis if you would prefer. The area felt very safe and the apartment block secure. We used the small supermarket on the complex for our basic needs. Would definitely recommend especially if you like being slightly away from the main hustle and bustle. A well equipped apartment with some lovely personal touches. The apartment had everything we needed for our short break. It was clean and comfortable and the extras, especially in the bathroom, made this apartment stand out from others we have stayed in previously. The security of the Garden Residence made us feel safe and relaxed. It gave us an excellent base from which to explore the city of Krakow. We highly recommend the Schindler's Factory museum which was just around the corner from the apartment. We ate out at two local restaurants Ogrod Kulinarny (attached to the complex) and the newly opened ORZO people-music-nature. The food was of a high standard at both places and fantastic value for money. We also found getting around Krakow easy as we purchased a 72 hour (other periods available) tram ticket from the machine at the stop, which we then validated using the machine on the first tram we used. After that it was just a case of hopping on and off at our will. An added bonus for us was that being the end of November the Christmas markets were open - very picturesque and atmospheric, especially in the evening when it snow! Super Kurzurlaub, Krakau ist eine sehr schöne Stadt. Eine super tolle Unterkunft, sehr schöne kleine Wohnung mit allem was erforderlich ist. Getrübt hat das Ganze nur die sehr laute Musik des unten angesiedelten Fitnessstudio, teilweise bis 22:00 Uhr. Jedoch werden wir diese Unterkunft das nächste Mal wieder wählen. Très bel appartement, bien situé pour visiter Cracovie à pieds ou en tram. Thank you very very much, Pascal, for your kind words. For us, the most important thing is that you liked my apartment and really enjoyed your stay in Krakow :-) Hope to see you again. Merci beaucoup, Pascal, pour vos aimables paroles. Pour nous, le plus important est que vous avez aimé mon appartement et que vous ayez vraiment apprécié votre séjour à Cracovie :-) J'espère vous revoir. was man zum täglichen Leben benötigt. Die Gastgeber haben uns im Vorfeld umfassend über die Sehenswürdigkeiten Krakaus, die Gastronomie und interessante Tagestouren informiert. Wir wurden nicht enttäuscht. Die Wohnung befindet sich in einer gesicherten Anlage mit Tiefgarage. Die Schlüssel waren bei der Rezeption hinterlegt. Alles erfolgte schnell und problemlos. liegt nur einen Steinwurf entfernt. Das jüdische Viertel ist ebenfalls fußläufig zu erreichen. Selbst die Altstadt ist nur einen Fußweg von 30 Minuten entfernt. Neben dem Eingang mit der Rezeption gibt es einen kleinen Supermarkt, in dem wir bequem das Notwendigste einkaufen konnten. Die Stadt Krakau ist absolut sehenswert. Die Altstadt und das Schloss mit seiner Kathedrale sind wunderschön. Der Besuch Krakaus war ein würdiger Abschluss unserer Polenreise.